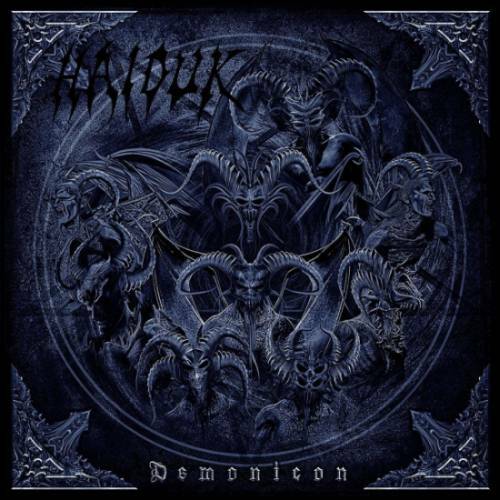 Canadian one man blackened death metal project Haiduk have been forging metal from the cold forests of the north for five years, and ‘Demonicon’ is their new album, following 2012’s ‘Spellbook’. Opener ‘Syth’ instantly brings you into the swirling storm of arcane rituals and black magic. A grinding guitar line faces off with a machine gun drum rattle, while esoteric harmonies howl into the night sky. ‘Nazon’ is an instant classic, roaring vocals belching rage over the blackened battering your ears are receiving. A dry production really adds to the almost necro feel of the music, while the actual song writing and technical wizardry on show is, at points, breathtaking. ‘Deamris’ conjures up the chaos of early Sodom, with its relentless thrashing bludgeon. ‘Demonicon’ is full of these waspish tracks, where rapid tremolo riffing meets the low end of death metal and the energy of thrash. While the songs all feel a bit samey, the sheer fury on display can blast you past this feeling of familiarity, and towards acceptance of the viciousness of the whole release. I love ‘Azyr’, with the sharpest fretwork fireworks on display. The man behind the project, Luka Milojica, certainly has some chops, and its rare to find music played this fast to be also technically proficient. ‘Demonicon’ barely pauses to give you a moment to catch your breath. Like the steamrolling ‘Vordus’, the album has no time for stopping, or for that much variety. But its a solid piece of blackened death metal fury that will satisfy all but the kvltist of arseholes!